For many years now one of the biggest areas of difference between the government and the council has been in the area of transport. Nowhere was this more apparent than with the City Rail Link where the government dismissed the project for years until it became politically untenable to continue doing. Even when government agencies and the council/AT worked together – like on the City Centre Future Access Study – the two sides couldn’t agree even on some of the basics. While the government changed its position of support for the CRL back in 2013, the two were still worlds apart on the future of Auckland’s transport system during the Long Term Plan debate last year, most notably over the issue of how to pay for future projects. In August last year there started to be a light at the end of the tunnel – and it wasn’t a train coming through the CRL. The council and government signed a Terms of Reference for what they called the Auckland Transport Alignment Project (ATAP) which over the course of a year would look at trying to come to an agreement on a broad 30-year plan for transport in the region. 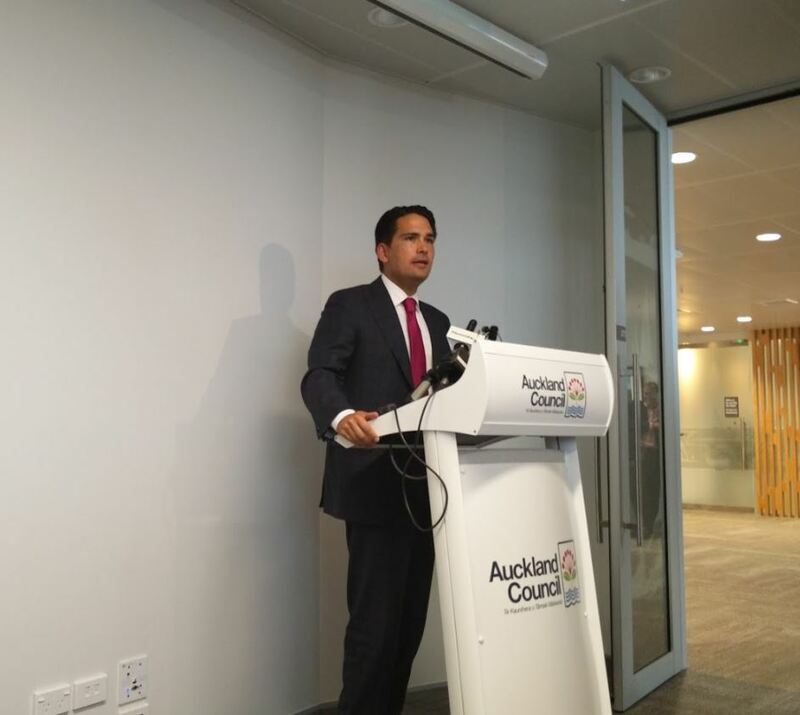 On Friday Transport Minister Simon Bridges and Mayor Len Brown released first of three reports ATAP will produce over the course of the work – the Foundation Report. Before going into that I must say I was quite impressed with the speeches, especially that of Bridges who I thought covered some of the issues very well. He even talked about trying to take the politics out of transport as much as possible and ultimately that is what ATAP is about. The Foundation Report is essentially all of the agencies involved agreeing on the assumptions and evidence they will use to assess how effective potential solutions will be. This is important as by having an agreed set of inputs to the process they should avoid the disputes of the past were each side ended up with widely different results. It also helps to define just where the focus on solutions needs to be. transport projects, services and policies). This will be used to try and find the ultimate package they end up recommending. Having picked the low hanging transport fruit they note that solutions from here on out get much more challenging and expensive – although I’d argue they haven’t quite finished picking all of the low hanging PT and cycling fruit just yet. I haven’t had a chance to read all 64 pages of the report but at first glance it appears to cover many of the issues we’ve been highlighting for years which great to see. Auckland’s geography presents a number of major transport challenges and opportunities. Infrastructure and demand are focused into a small number of narrow corridors, leading to congested pinch points across the transport network. 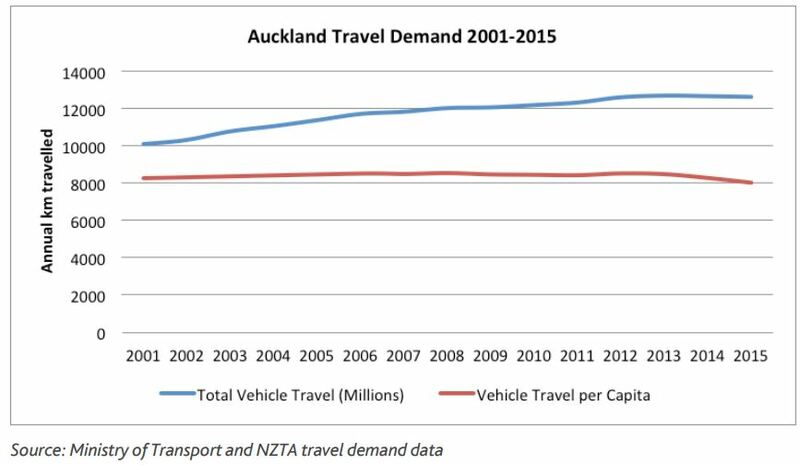 Conversely, this concentration of demand should be well suited to supporting high capacity public transport systems – although Auckland’s relatively dispersed employment creates challenges for the efficient provision of public transport. I guess another way you could say this is, we have a geography which through its multiple pinch points is almost uniquely suited to high capacity public transport solutions but we stuffed it up by spreading employment too thinly – which of course we did in the belief it would reduce congestion. Moving on to how Auckland has been performing recently. Over the last decade or so Auckland has had significant investment in transport which in part is starting to catch up on decades of underinvestment. 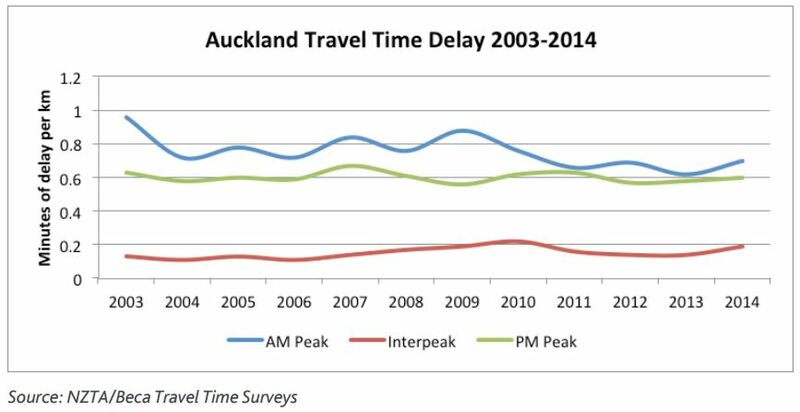 Since 2003 the regions population has grown by about 300,000 yet they say travel time surveys show that AM peak congestion has actually fallen, PM peak is fairly stable while there’s a slight upward trend in interpeak congestion. They do note that this is at a regional level and some areas may have more localised congestion issues. They also say travel time variability has increased. They also note that people at an individual level are driving less but that had been offset by population increases however even the total vehicle travel has flat-lined recently. PT use has also improved but as we talk about that regularly I don’t think I need to cover it again. Comparing Auckland to the key Australian cities they note that on average we have less congestion all of them with the exception of Perth. Where we do struggle is with travel time reliability and particularly in the afternoon peak. Of course with the exception of Adelaide, Auckland is smaller than all of these cities. ATAP are using Stats NZ medium growth projection which out to 2043 sees an additional 700,000 people living in the region. They also expect another 250,000 jobs in Auckland with the sector seeing the most growth being business services. The maps below show where the growth for both metrics is expected to occur. The darker the colour the more it is expected to change. The shaded areas are the future urban areas. 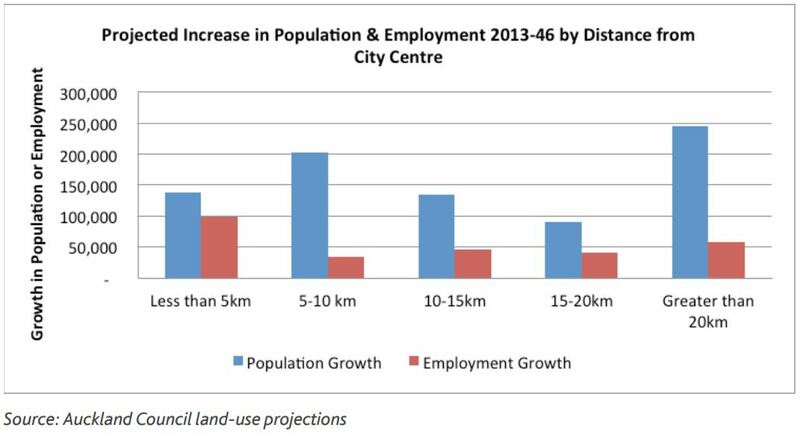 One of the concerns they’ve identified is that a significant amount of the population growth is expected to be over 20km from the city centre while much of the employment growth will be closer to the centre. Again they seem to be suggesting that road focused solutions are going to struggle. These projected household and employment growth trends will place significant pressure on the transport network through longer trip lengths, especially to major centres. The low level of growth in local employment is also likely to make improvements in employment access by car more challenging, as trips lengthen and become relatively more focused towards major centres with constrained access. Furthermore, the high value of land in major centres presents a key challenge of providing significant people-moving capacity without using extensive amounts of space. Despite this they’ve tried to predict the future vehicle travel demand which they think will increase substantially over the next 30 years. They say the demand growth is largely in line with population growth so effectively represents a flat-lining of per capita car travel. ATAP is also considering the impact of technology changes. They make no predictions about what will happen but do say that the next stages of the project will look at them in more detail and the impact they would have on the options they assess. In addition to the objectives they’ll also be assessing the packages against some other outcomes. Again there are one or more measures and KPI’s under these outcomes. So here’s how it performed. 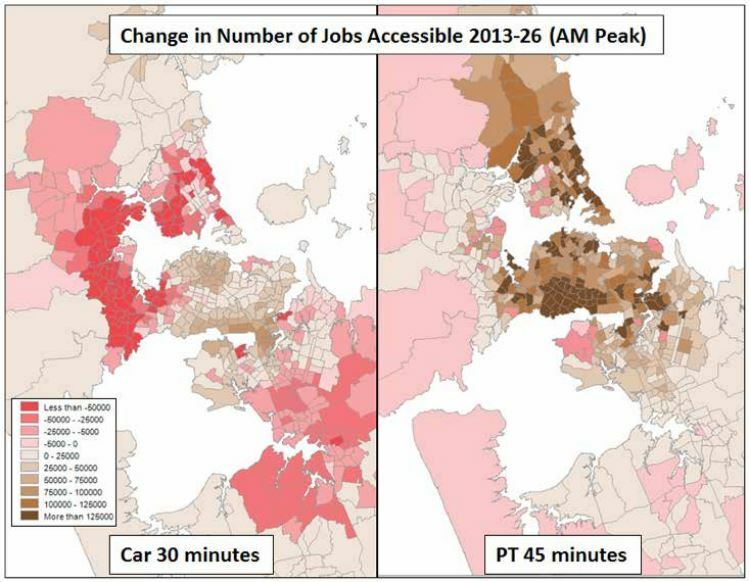 Over the 30 years the proportion of jobs able to be accessed by a car within 30 minutes declines while the number of jobs accessibly by PT in 45 minutes increases but the rate of that increase reduces after 2026. 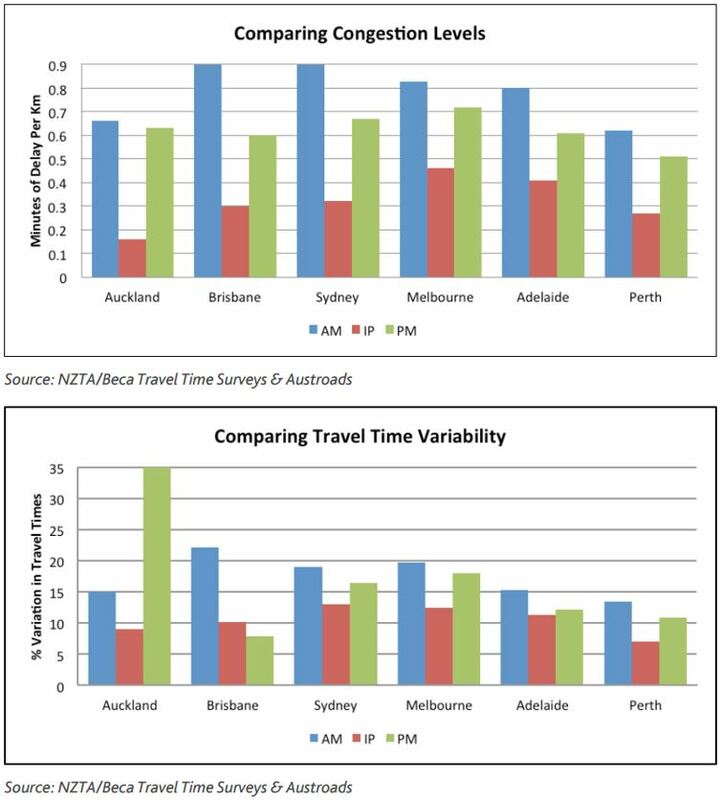 The report doesn’t say why they assess cars and PT using different travel times. This is shown more visually in the maps below. 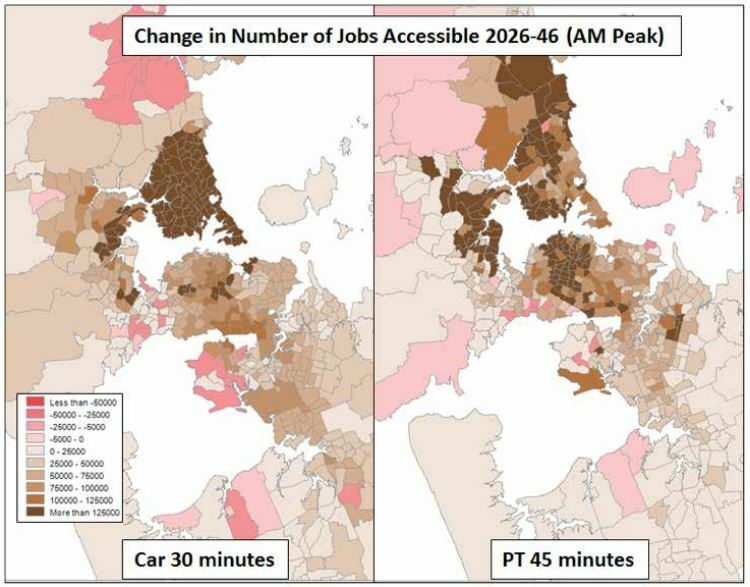 Out to 2026, despite the investment in the Western Ring Route jobs accessibly by car decline most significantly in West Auckland while PT improvements are mostly in Central Auckland and the North Shore. At the end of the 30-year period it’s the North Shore that benefits most with the most improvements in both car and PT results. The Northwest Busway obviously has quite an impact too. In all scenarios West Auckland (as opposed to the North West) and South Auckland don’t fare all that well compared to other parts of Auckland. They note that this is something they’ll need to address through the ATAP process. 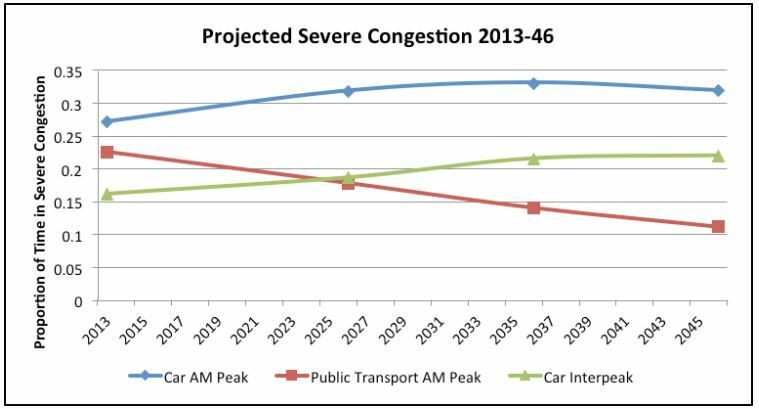 Overall congestion is expected to get worse for cars with the biggest impact being off peak. For PT though the increase in the Rapid Transit network or use of bus lanes means that PT trips suffering from road congestion will improve. PT modeshare is expected to increase from 7% to 15% over the 30 years. Combined with walking and cycling driving modeshare is expected to continue to decline. Taking out active modes and PT modeshare rises from 13% to 29% across the region but will obviously be much higher in some areas like the city centre. Overall it’s an interesting report and given the constraints on the road network – i.e. there isn’t any space for new or much wider ones – suggests they’ll need to significantly improve what is planned for PT if they want to get better transport outcomes for Auckland. Getting more people on PT will be the best thing for those that need to drive. This is a good document. It is right to start with the permanent facts of our geography and the limitations caused by previous development. It is essentially a modelling exercise, however, so therefore will succeed or fail whereever the models are limited. There are some issues already apparent. One is the reliance on Journey To Work data only. We have long criticised this, it is simply not true that only those commuting are undertaking trips that are valuable for the economy. Education, consumption, entertainment, and accessing social services are all vital and meaningful trip generators. They use JTW because they have historic data and, I guess, because work trips look like more of a vital input. But in an urban services economy journeys for consumption are the essential other side of the economic coin. Accessing the poorly placed and desiged St Luke’s mall, for example, is a transport problem. It seems the model does not directly count many millions of journeys because of this narrow definition. For the next census in 2018 Stats NZ did consult on whether they should widen that “Journey to work” question to be more than how did you travel on census day as your “main” journey to your paid employment [providing that you did paid work in the last 7 days]. But whether it will be widened to cover just the main trip, or more than the main trip [e.g. if you drive to the Park N Ride catch the bus/train then walk to your work – are all 3 able to be captured). There is also the related issue as to whether the “alternative” options allowed by the question to the current “journey to paid work” trips is only for “education related” travel – that is also still to be confirmed. If they do widen this census question [which is well overdue to be revamped], then the models used by planners, and the ATAP reports that use it may need a serious revamp post 2018 Census to handle all those other trips not captured in the past by the simple “journey to work” question. An additional issue, which I look forward to taking up in detail later, is that the model seems to assume that any quantity of vehicles can be added to local streets that the motorway and arterial road systems deliver. This seems particularly, but not solely, a problem in the city centre. Additionally vehicle parking seems also to be assumed to not only be automatically available but also always proximate to any destination. So if, say, as the AWHC is projected to do, 20k+ drivers are suddenly to be added to the 30min access to the city centre, are models really saying this is not only possible in practice, but also won’t have any deliterious effect on the true 30 min travel time? Won’t more and more drivers find they are parking further from destinations, some even, as is already the case, taking a final PT leg to complete their journey? And we know parking supply is actually falling in many places, and new supply unlikely on to be added at anything like this scale. And nor would it be desirable as it is an unproductive Landuse in city centres. Which is to say that the new access the model predicts after vast investments on things like AWHC may not, in practice actually eventuate, because of spatial limitations at destinations. Of course this can also be true for PT, if bus or train, or ferry amenity in centres is not expanded then new capacity at the fringes will be able to be realised. Yeah, try asking many of the workers who work in new offices in Highbrook, how “proximate” their SOV parking is to their place of employment. A drive along Highbrook any day of the week will show masses of parked cars all along the side roads, with many people who park those cars walking some big distances to their “adjacent” offices. None of which is captured in the JTW data above because in the past when asked for their journey to work, it was only the “main” trip that was counted – and if you ask people how long their “main” trip was on Census day they’d invariably tell you the driving part not the walking part. And as they can only give an answer for 1 trip thats all you’ve ever captured in census data. It is not clear why measures of employment accessibility need to be separated by mode – the KPIs are the number of jobs within a 30 minute car trip, and 45 minute PT trip. Is this not counterproductive to their aim to increase the PT mode share? I thought this too, this difference locks in the belief that PT is an inferior good – look its 50% slower than driving, so you only use it as a last resort. Those KPIs should be the same for both mods at the very worst, [45 minutes KPI for both sounds a reasonably achievable KPI]. But in fact I think the PT KPI should be lower than the driving KPI to enshrine the superior position PT should occupy in the planners mind, so that they go out of their way to make PT the fastest option. Because even if it costs more money inthe short-medium term to deliver that KPI, it will be cheaper in the long run than yet more roads and sprawl everywhere. The difference maps are the most useful for planning growth I guess, but I’m also curious as of what the current situation is. And what does 30 minutes mean? If Google maps says 30 minutes on transit, it pretty much means 30 minutes door to door. By car on the other hand, it only includes the actual driving (it does take into account congestion these days, although it can underestimate delays). It does not count for walking from and to your car, finding parking, and manoeuvring in and out of parking buildings. When Google Maps says 30 minutes by car and 45 minutes by PT, PT could be a wise choice, especially if you’re not sure about finding parking. OTOH that PT journey might only start 30 minutes from now (that is common off-peak and during weekends), and the difference between car and PT is usually much larger (except maybe rush hour towards the CBD in some areas). For me it is currently around 20 minutes by car, 45-60 minutes on PT, so taking the bus will mean I spend more than an hour per day extra on commuting. Seems quite realistic to me. On the odd time I drive rather than take the train it takes me about 30 mins but feels like about an hour after dealing with traffic! I could not agree more with Greg. this is still largely car based thinking. Mass transit should be prioritised above car. overall I think up to 45 min is OK for mass transit, although 30 min would be much better. part of getting there will be to discourage cars. e.g. if we want bus priority, then the bus corridors need to be permanent, and street parking massively reduced. This is key to getting mass transit to be the better, faster, more reliable alternative. As a bus user, I don’t want us prioritising mode, I want us to focus on the speed, timeliness etc. of the journey and then working out which modes best satisfy it. For me, right now, bus makes sense, but that doesn’t make buses “better.” If it were cheaper and faster to drive, driving would be better. Why only speed and timeliness? We should also be taking externalities into account. Pollution, fossil fuel usage, safety, space efficiency, cost to provide for the marginal user. I’m pretty sure the overriding factor for most decisions on how to get to work, is that there are only so many hours in a day. Think about it, are you going to spend an extra 1.5 hours per day away from your home or family for any of these reasons? people will make a rational decision to take the fastest mode possible, whatever that mode may be. But when transport spending is planned around a target 30min car trip and 45min PT trip, the car is always going to be the fastest option, because that’s where transport funds will be spent. Dan C, exactly right. They ae effectively targeting car trips to be faster than PT for some reason. am I the only one that saw 250,000 new jobs for 700,000 new people? 1 job for every 2.8 people?! That is a staggering fail! Jobs really should be around the 1 job per 2 new people at worst (taking account of retired people, kids, students etc) That means that there are likely to be an additional 100,000 people unemployed in Auckland at the 2.8 rate. 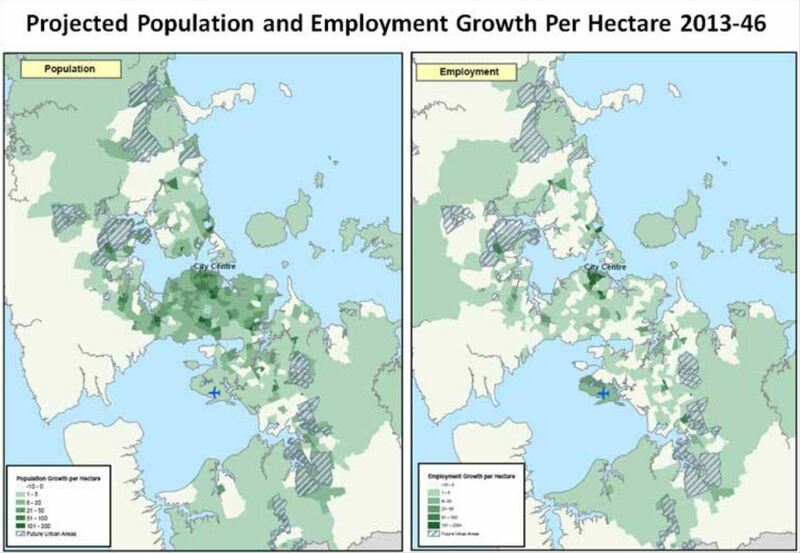 Given that Auckland’s population has a demographic ‘bulge’ heading toward retirement (see p17 here: http://www.aucklandcouncil.govt.nz/EN/planspoliciesprojects/reports/Documents/aucklandprofileinitialresults2013census201405.pdf), and a good proportion of growth comes from natural increase, this is not hugely surprising. However it does have implications for the transport network – commutes to education (school and universities) will be increasingly important, and also retired people have different transport needs, so may choose to locate and travel based around access to healthcare service and leisure activities, instead of commuting to work. yes, I haven’t crunched the numbers myself but I wouldn’t be surprised if the change can be attributed to shifts in age structure caused by baby-boomers. Treasury have done some useful analysis of the impacts of these retirements on NZ’s health and welfare systems, which will need to be funded off the backs of fewer workers (in a proportional sense). I think this is worth repeating here, because everytime we talk about population growth on this blog there’s a small minority of people who pipe up and argue for turning down/off the immigration tap. These claims are usually made without acknowledging that doing so makes it harder for NZ to sustain current policies, such as super and public health. And often (not always) it’s people from an older generation who ague for reduced immigration. This is somewhat ironic because people close to retirement now are actually those that stand to benefit the most from immigration: Their super and hospital bills will be paid for by young people (and most immigrants are young) who enter the workforce now! In any document projecting outcomes in the 2040s or beyond, it’s instructive to consider to what extent the plans address the climate change imperatives. Encouragingly, greenhouse gas emissions are noted as a measure, though only an “other” objective as part of safety and value for money outcomes. On the other hand there’s no reference to the Low Carbon Auckland Action Plan, which quantifies an objective of 40% reduction of 1990 GHG emissions by 2040 (and 10-20% by 2020). Worth bearing in mind that the Paris COP noted the need for essentially 100% reduction globally by 2050. Meanwhile if all countries actually deliver the INDCs tabled in 2015 (which aren’t planned to be reviewed until 2020) the average temp rise will be 3.5C (or 2.7 C with some heroic assumptions about negative emissions for which we the technologies simply don’t exist). 3-4 C is insane!! In this context, transport in cities such as Auckland will have to change radically, and much faster than many people realise. Fully decarbonised, and very likely consuming substantially less energy than today. The “low hanging PT and cycling fruit” must be picked quickly: trying to do that wholesale in 2040-2050 along with everyone else will be impossible. It’s distressing to see the lack of new public transport investment in the Long Term Plan. It has been created as if there’s no such thing as climate change, and to my mind it needs urgent and major revision. Take a look at the long term maps showing access to jobs 2026-46. For the whole of the North Shore it seems we are planning to create an auto-dependent future that will just force more and more vehicles onto roads all over Auckland. You get what you invest in, and for North Shore that’s 30 more years of motorways and road widening. This is a very interesting document, but to me it really shows how very out of touch with current realities our planning has become. I agree that significant investment in PT is needed and will be much more efficient than relying mostly on the use of cars. However by 2040 most cars will probably be electric, so even if we have millions of cars on congested roads, if they are electric we are not looking at huge carbon emissions/pollution etc. I searched for the word ‘climate’ when I downloaded the report. Zero mentions in a document supposedly strategic and for the next 30 years? Ridiculous, incompetent nonsense. How come the west job access in both pt and car suffers on the next few years? So does it means the motorway widening and train could not cope? Shall they start to invest more? I have a hunch that the model ‘penalises’ PT transfers. Both west and south are planned to run on a network PT system based around frequent bus/train combinations. the model is quite likely to have been built by car users (almost certainly) and people who only or predominantly drive always assume that the more car-like a movement system is the better it is. One standard outcome of this is they tend to assume one-seat rides are ideal. In short they fail to properly understand the power of transfers in a system with fast and frequent services. They also fail to grasp the power of permanent unchanging services too, but that’s another story. The key point here is that if the New Network rolls out as planned, ie with plenty of buslanes, well designed interchange stations, and high frequencies, and the core rail system is optimised with reliable high frequencies and better speeds, the model may well be wrong here. It may have assumed high time and cost penalties to transfer, and there that 1. Trips will take longer than they actually will and 2. That fewer people will use these services. A possible hypothesis. Alternatively it suggests that more effort needs to go into making sure the services to these areas are better, faster, more frequent, more direct. Especially suggests those dwell times need sorting on the trains. No you couldn’t say it that way and we didn’t do it to reduce congestion. We did it, because dispersal facilitates some key sectors of employment. Industrial activity favours low costs over high connectivity, whilst service sector favours high connectivity over low costs. Industrial activity is non-reliant on peak flow mass transport – will spread production to non-peak times and establish in lower rent non-central areas. Auckland has a large industrial sector, which favours dispersal. We didn’t stuff anything up by dispersing, quite on the contrary dispersal has enabled job growth in this sector. Urban transportation policy should recognise the need for dispersed industrial employment and compact service sector employment – then work to balance the needs of both. “Industrial activity is non-reliant on peak flow mass transport”.. true, apart from the people that you need to do the work. Spread shift start times to non-peak hours. A response which ignores the impact on social participation of shift work. Usually the people recommending this wouldn’t be the ones having to do shift work themselves. Nevertheless it is a response that enables the shift workers to avoid a tripling of their commuting time. Usually the people recommending an end to shift work wouldn’t be the ones having to spend an extra 3-4 hours a week doing their commute. Decentralisation of jobs and other trip attractions will restrain travel growth in the major radial corridors and the report sees this as the only way in Auckland of minimising investment in the transport system, cutting users’ costs, achieving the lowest social and environmental costs and bringing maximum benefits to the whole community. The preferred land use strategy from a transport viewpoint would therefore promote a high level of job self-sufficiency in outer sectors, limit employment on the isthmus and develop outer sectors in a way which will promote more use of non-radial transport corridors. “Transport prefers dispersal of jobs to avoid expenses like the central motorway system and Harbour Bridge,” said Mr Pringle. “If employment in Auckland continues to remain very centralised , we have to find perhaps $70 million for a new harbour bridge. The public sector would also have to find money to upgrade sewage and water supplies to the isthmus. Based on what has been observed since then here and around the world that policy did the opposite and increased congestion. That is a document showing the ability of 1976 transport planners to foresee the positive outward growth of an urban area and make a case for it. A commendable characteristic that saw the expansion of cities, here and around the world. But in the interests of balance, where in the central isthmus would you have placed the Glenbrook Steel Mill so that it might be accessed with excellent public transport? Foresee the future, no they shaped it. No one is suggesting industrial land be in the CBD but there are a lot of office park stuff that is spread all around that should have been closer to the city. The focus on trying to reduce short term costs meant a more expensive system overall because now having to build what they failed to and we suffer the congestion as a result of previous policies that we are stuck with. I’ve done a bit of research and come to the conclusion that you are more right than I was. “It is important to assess whether further increases to transport investment in Auckland generate net benefits for those who will be paying the extra costs. Policy interventions such as road pricing achieve improved performance of the transport network through raising the financial cost of travelling. It is important to weigh up the costs and benefits of pricing interventions to establish whether the additional financial costs of a road pricing charge are outweighed by the time savings benefit they provide to road users. This seems to be saying that they havent yet worked out if the APTN will provide positive net benefits. Now that is a lot of work to be sure, but shouldnt that be front and centre of what they are trying to do instead of something they’ll do later maybe? They also seem to be setting up the wrong test for the appropriateness of road pricing. They are saying that road pricing is going to increase costs for road users but in doing so deliver time saving benefits. Actually (depending on transaction costs) road pricing should decrease costs for road users overall by enabling infrastructure spending to be deferred or avoided. Clearly they need to look at the costs and benefits of road pricing to all road users (and taxpayers), not just the users that will have an increased cost (peak users and users of capacity constrained corridors). And that appears to be the only place in the document where road pricing is mentioned. With such a focus on congestion, you would think they would spend more time looking at the only feasible solution to congestion. 1. It should be net benefits not net user benefits. Why are we ring fencing a certain group of people and counting benefits to them only instead of, for example, safety benefits to peds, air quality, CO2 emmisions etc. 2. This seems to have a huge amount of status quo bias embedded into it. They are saying that we need to make sure noone pays more without getting commensurate benefit. But this neglects to question whether the current system is fair in the way it apportions costs and delivers benefits. In other words they seem to be saying that all current subsidies are “grandfathered in” and we can only change things in a way that retains these subsidies. Section 5.5 is a very short little bit of the report (and one of the only sections I have actually read), but it is throwing up a huge number of alarm bells to me right now. MW. Thank you. That was exactly the question I asked at the launch: ‘Shouldn’t the word ‘user’ be deleted from that sentence in order to ensure that changes beneficial for all are possible?’ The answer was that they won’t or can’t make changes to the principles. This is so frustrating. It is the principles above all else that need to be carefully calibrated. And yes I agree that the outcome here, if perhaps not the intention, is to retain the preferential position of embedded players. Status quo bias indeed. That choice of wording locks in the selfish ideology of the current government – or course they won’t countenance revisiting it. Future ones won’t have any choice as climate change bites harder. Yes its a pretty big contrast between the consultation that went into the Auckland Plan and Unitary Plan, and the lack of any consultation on this potentially very important document. As someone above stated, if we began from a “maximise number of people within 45 minutes commute to work” target it might lead us to different designs. You’ve hinted at an interesting public policy tension between projects and targets, and the simultaneous causality that exists between the two. Now I do agree that in an ideal “public policy” world the targets should determine the projects. Problem is that in the real world projects determine targets, for a whole swathe of reasons. In this context, perhaps a “better world” is one where targets are used to influence the timing of project delivery. This indeed is what we had with the Government’s targets for the CRL. While the targets themselves were rather random (especially the employment one), the concept itself is fairly sound: Identify projects and develop designs/secure designations etc. And then identity some key outcomes that trigger the final investment. I think we can all agree minimising the cost and effort required for EC to get from home to the CBD is a worthy target. I am supportive of any and all mechanisms to achieve this, including building me a flying fox. First thing you hear from a PT: what is your goal? Strength, weightloss, endurance, explosiveness? And then they design the programme to fit. What we want to achieve is a reduction in auto-dependency. We want to break the dominance of the transport mode which incurs the highest external costs and impacts. We want to provide realistic transport alternatives for people to use wherever appropriate, and to encourage land-use development to make what is “appropriate” more widespread. The goals to me are crystal clear. Cars are not bad in and of themselves. Buses are not good in and of themselves. What matters is what is achieved via the delivery of a particular transport infrastructure. An analogy that may make sense: heart disease / diabetes. To reduce this, you ask people to reduce fat and sugar consumption. But reducing fat and sugar is merely a means to the end of better health. Now, it may well be that *right now* the best means to achieve our end of a faster, safer transport system for Auckland is PT. But that’s not necessarily so at all times. You’ve heard the saying “there’s more than one way to skin a cat” and that’s the sort of thinking we need. As long as the cat gets skun (is that a word?) then who cares how it happens. Trouble for your theory is that the current government does not make rational decisions. See RONS. Yes, but we should always aspire to the Platonic ideal of policymaking. Even if we can’t get quite all the way to Anderson, we can at least get to some of the better versions of Lindblom! It does get a bit tiresome to see these “either-or” strategic transport documents that only look at driving vs public transport. The entire Foundation document mentions “walking and cycling” (always together as if they can’t be evaluated separately…) a grand total of THREE times in 64 pages. This is despite the fact that the chart above shows that walking and cycling will continue to contribute more AM peak trips than PT! 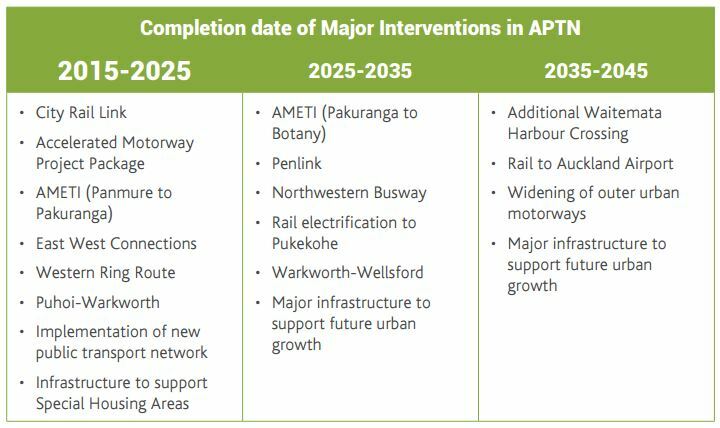 Meanwhile the table of “Major Interventions” is all about roading and PT projects (at best, you could argue that a few like AMETI have some cycling add-ons) – how about a Major Intervention of completing a city-wide cycling network? Or safe walking/cycling routes around all PT nodes and shopping centres? It would also be useful to include a metric of jobs accessible by bike within 30 mins; that’s a 10km radius without really breaking a sweat. Mind you, as someone else mentioned, the importance of improving walking/cycling really comes into its own for those other local activities (like trips to school, shops, etc) that are currently being driven. “Oh, but walking & cycling can only change the modal numbers by a few percent, so they’re not real game changers” – this kind of thinking forgets that congestion is exponential, especially as you near capacity. So you only need to knock off a few % from volume/capacity levels to get big changes in mean traffic delay (and even bigger reductions in the variability of delays). Regarding the difference in jobs accessible from the western North Shore after 2026, is there a planned project(s) that will be driving this difference compared to the pre 2026 map? Yes, the additional road lane harbour crossing. And this is a sign of the incompleteness of the model, for there is literally nowhere for those additional thousands of cars to go in the city centre. Re Nigel Owen’s comment above: I’d like to think that by 2040 most cars will be EVs.. but this is not easy, to put it mildly. The paper suggests retrofit kits to accelerate the change. But another scenario that isn’t discussed (which I find odd: long-term projections that are trend-based are pretty useless when step changes are in play) is that the only realistic option will be simply to drive less, much less than we do today. So a lot of investment in shiny new motorways could be stranded and will need to be written down. Oops. Seriously? Absolutely: transport is the biggest cause of Auckland’s GHG emissions. It just isn’t sustainable. Gradually changing the fleet just won’t cut it, we’re probably 20 years too late for that. Which is pretty dumb, when you consider the 1990 IPCC said more or less the same thing that last year’s did. We already knew way back then what we know now. That’s like suggesting not increasing current dairy stock numbers – heresy!